When these rushers get home, they are very good at causing the turnover. 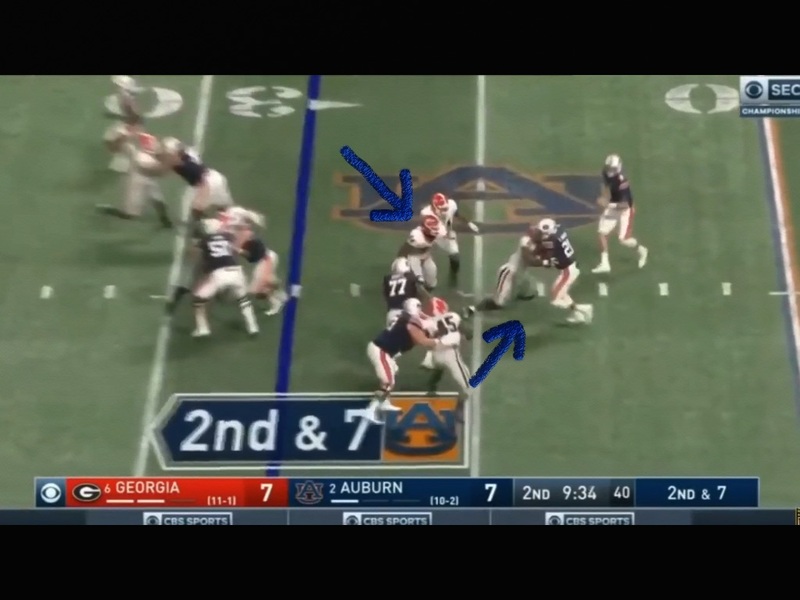 Against Notre Dame, a similar play iced the game, and here on 3rd and 6 after Auburn had marched all the way down the field, this one play completely changed momentum. 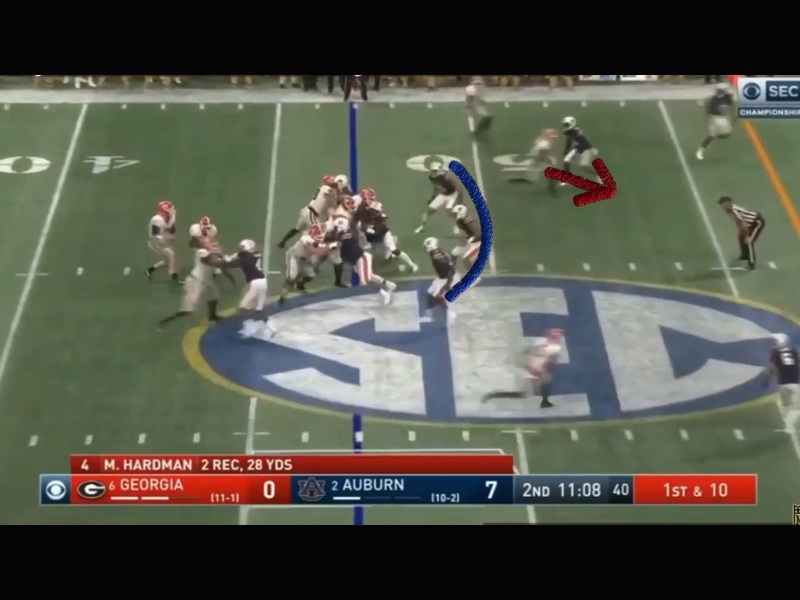 Had Stidham hung onto it, Auburn likely goes up 10-0, and if they protect em and keep the drive going maybe 14-0. Had that been the case I think Georgia would have laid down. 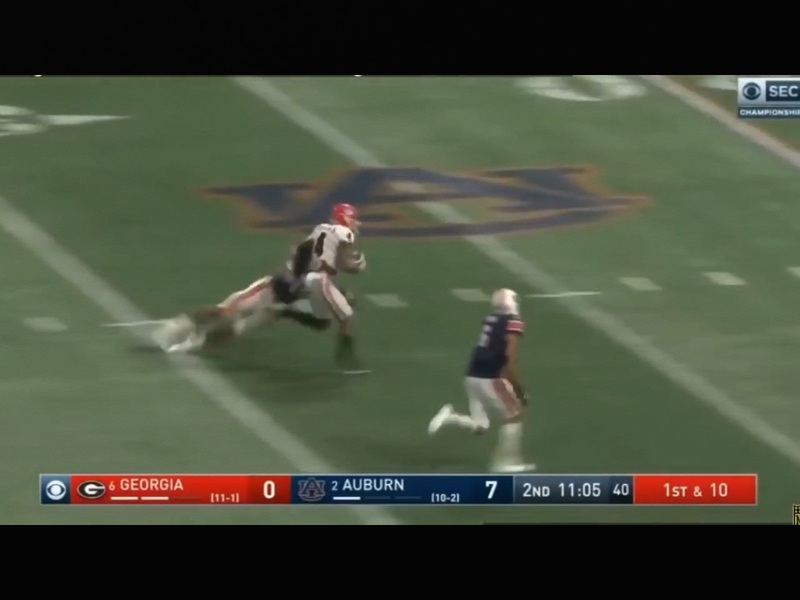 When you let Georgia get their play action game going, they’re actually a lot like the Sooners. Hardman, the red arrow receiver is a burner. He’s somewhere in between Hollywood Brown and Jeff Badet speed. Needless to say he’s too fast for comfort. After the play action sucked up the linebackers, a little slant turned into a 30 yard gain before you can blink. Giving up a big play to this guy is a possibility, and something that concerns me. 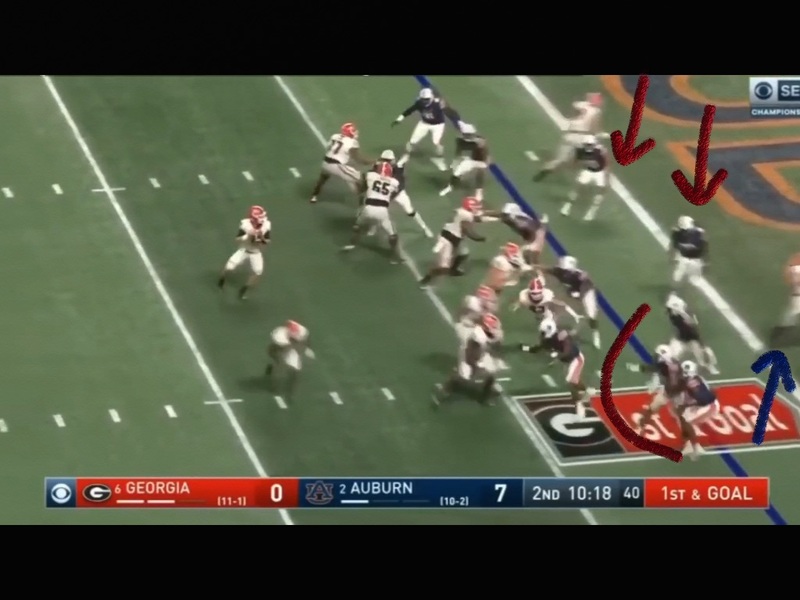 As the Dawgs got down the field, on 1st and goal, the Auburn linebackers didn’t know which way to go. 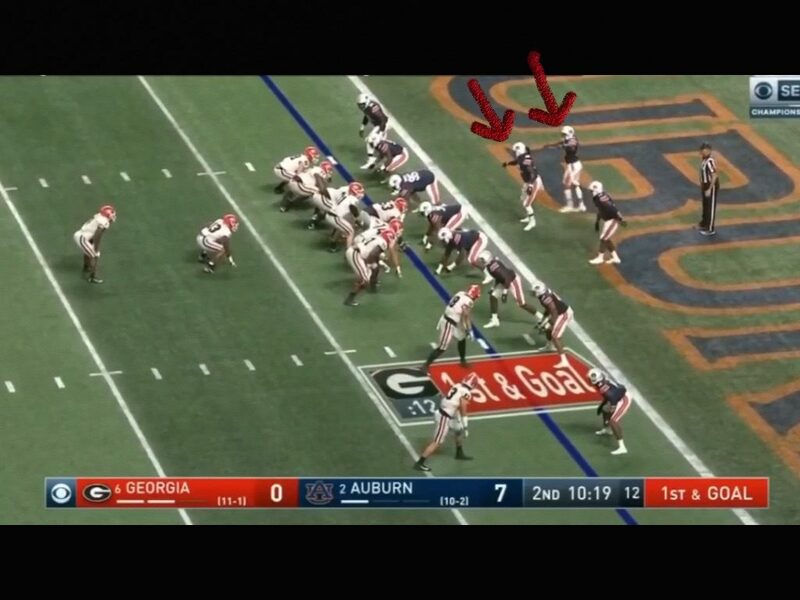 This isn’t a good sign when the Qb is already under center. On the snap, the TE, Nauta, looks like he’s going to block down on the linebacker on the toss to the right. 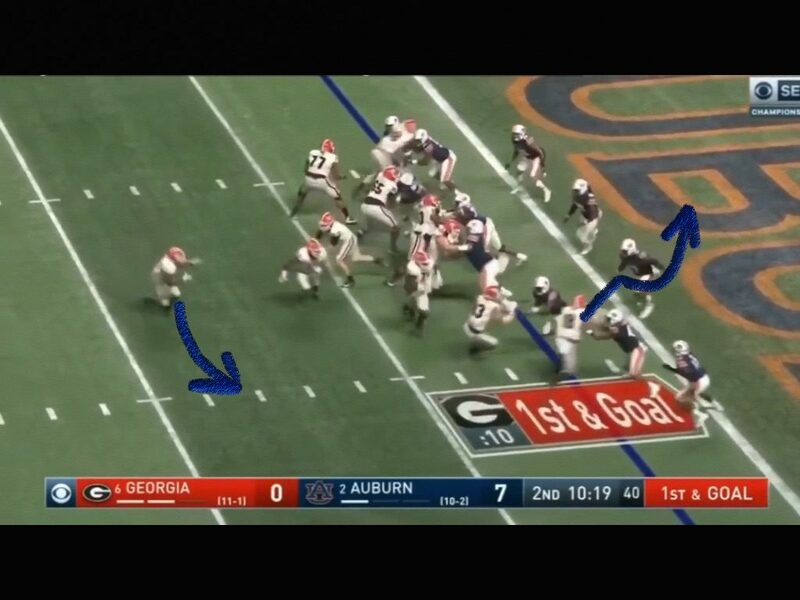 The fullback is leading for the rb, and with the play fake Fromm gives, it’s pretty convincing. 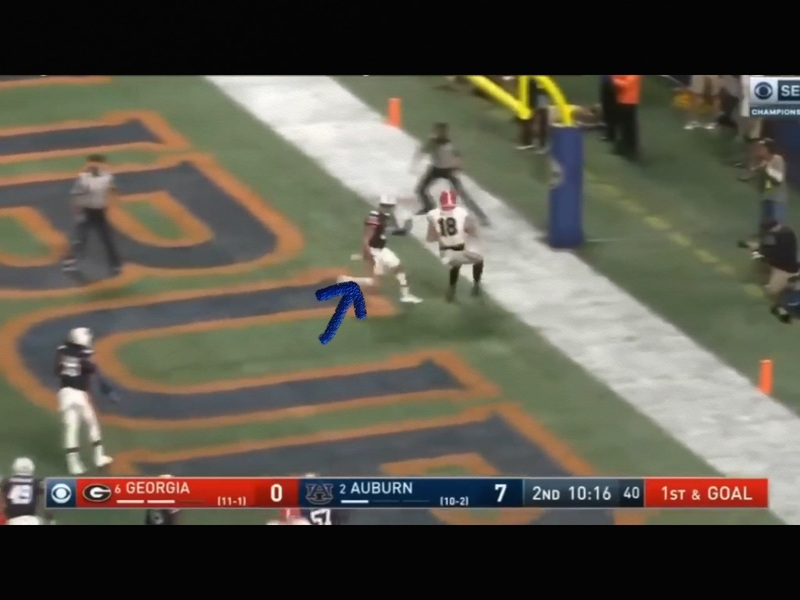 Nauta, blue arrow, releases, and half of Auburn’s defense let’s him go since they’re flying up so hard on the toss play. 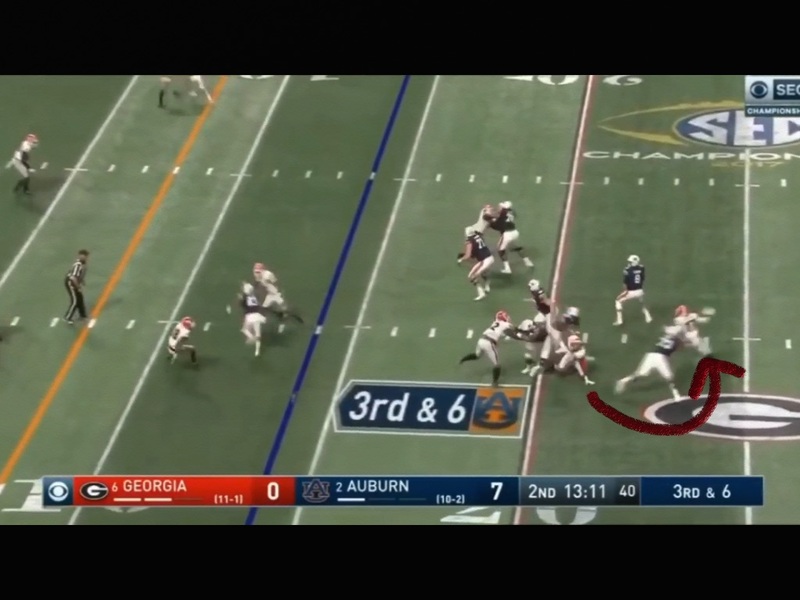 Both of the other linebackers have bitten as well, and it seemed like Fromm could have thrown it to either tight end. Immediately the safety is turning around to see who’s job was busted as the score gets tied. The play action game for Georgia is legitimate, and the Sooners need a two to three score lead to nullify this aspect of their game. And this is where the Defense started believing. Four defenders beat the blocks, and the defense starts swarming. The Sooners will need to start fast and get up a couple of scores. 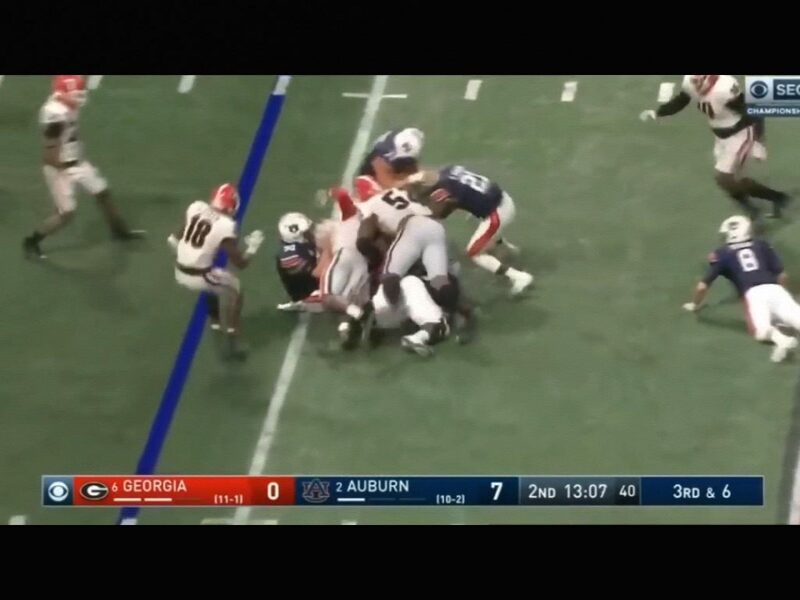 If they are able to do that, then I’m not too convinced that Georgia won’t cave a little bit. I’m a buyer in the Sooners’ mental toughness in a dogfight, but I’m not too sure that Georgia won’t have some doubts if they give up a couple of scores early.